Elizabeth (Betty) Bustin, 104, of Fawcett's Special Care Home, Petitcodiac and formerly of Portage Vale passed away Thursday, April 11, 2019 at the Moncton Hospital. Born in Kouchibouguac, she was the daughter of the late Martin and Jane (Lobban) Kelly. Betty was a homemaker and a member of the United Church of Canada. 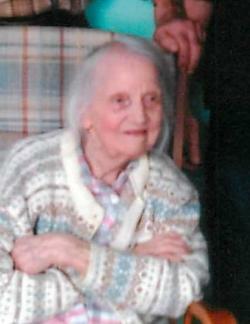 She enjoyed knitting, gardening and spending time with her family, especially her grandchildren. She is survived by her sons Ted (Elinor), Petitcodiac and Harold (Linda), Riverview; grandchildren Gregory, Tony, Terry, Cindy and Candace; several great grandchildren; daughter-in-law Thelma Bustin, River Glade and several nieces and nephews. Predeceased by her husband Tom; son Wayne; grandsons Scott and Timothy; brothers Martin, Alex and Jack and sisters Jessie and Jane. A Celebration of Life will be held from Armstrong's Funeral Chapel, 33 Russell Street, Petitcodiac (756-3361) on Sunday, April 14 at 2 pm with Rev. Stephen Brown officiating. Interment at Anagance Cemetery at a later date. If desired, donations to the Anagance Cemetery or a charity of choice would be appreciated by the family.